Societal stigma about mental illness continues to preclude many older adults from receiving necessary treatment. Untreated mental illness in older adults results in detrimental consequences including poor health outcomes, high medical co-morbidity, increased disability and mortality, poor quality of life, and higher annual health care costs. 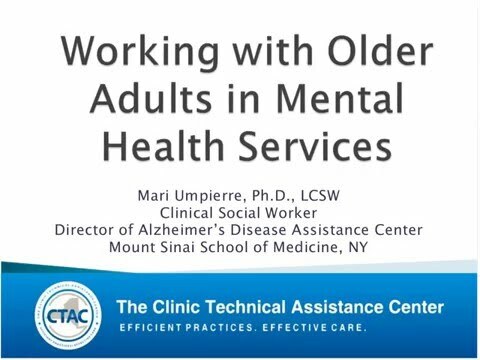 This webinar will provide an overview of geriatric mental health issues and will provide useful strategies and tools to work with this growing group of clients. • Prevalent mental health conditions in the elderly. • Common barriers and bridges to engaging the elderly in mental health services. • Tools used to assess mental health and mental health needs among elderly clients. • Available resources to inform and guide clinical practice, not only with elderly clients but also with their caregivers.